This article contains the best daily horse racing tips collected from the daily newspapers, best tipsters and professional punters. Find here today's Southwell selections and enjoy your betting with our exclusive bookmakers promotions and free bets. Take advantage of our expert Southwell betting tips! Our racing tipsters have spent a lot of hours analysing every horse's profile and stats. You will not find more accurate racing predictions than at BetAndSkill! Please visit our horse racing free betting tips section to get a real proof of what we say. You will find free racing tips on all the UK Racing and international racing, including UAE, France, US racing and South Africa. Wanna back our Horse of The Day? Take a look at our unmissable NAP of the Day betting article! Southwell Racecourse is set in the East Midlands countryside, and hosts both jump and flat action. The course holds 65 race meetings per year, on the flat all-weather track and the National Hunt turf jumps course. It is the only racecourse remaining in the UK which still uses Fibresand, a mixture of sand and wispy fibres, making it much deeper than other artificial surfaces. Despite some recent investment Southwell racecourse is still quite a bleak place especially in the winter when the wind is howling. 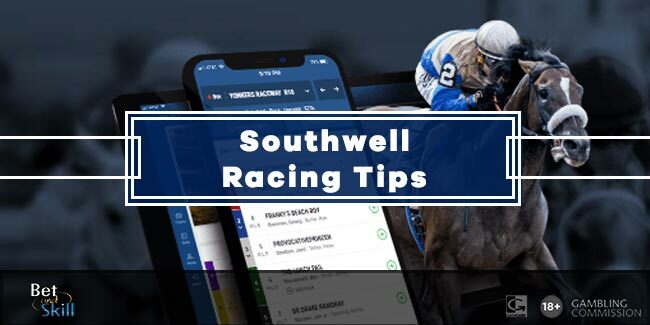 The all-weather track at Southwell goes left-handed in a flat mile-and-a-quarter oval which has a run from the home turn of three furlongs and a spur to provide a straight five furlongs. The hurdles course at Southwell Racecourse consists of five hurdles, three on the back straight and two on the home straight. The track is flat left handed and tight in nature, due to running on the inside of the all-weather track. The chase course consists of seven stiffish fences. The hurdles and the fences used are temporary, removable units which provide a fair jumping test for novices and pros alike. The brush-type hurdles penalise less-fluent jumping more than the traditional variety. Stamina-laden performers hold an advantage over their rivals and quite often American bred horses do well here. Horses who run handy to the pace tend to be the best profile to look for at Southwell. Southwell doesn’t have a host of high Class racing to offer. All-Weather racing tends to dominate from September through to April, when the Summer jumps program kicks in for Family Day and Ladies Day, the busiest day of the year on the course. Over 10,000 people were in attendance for the occasion last year and you should always expect a lively and vibrant atmosphere if attending yourself. "Today's Southwell horse racing predictions, tips and free bets"